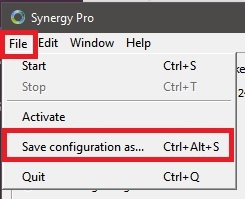 client app on mac laptop stuck on "Synergy is starting"
I installed Synergy on my Windows 10 PC in server mode and allowed it through my firewall; the application runs fine. I installed Synergy on my Mac laptop in client mode but the status says "Synergy is starting" and never changes to Synergy is running as on my server. The log states that the connection to server has timed out and it keeps trying to connect to the server. When I start up the client app (on the mac laptop), the server app (on the windows PC) detects that there is a new client and asks me to place the client on the map. However, when I move the mouse to the designated border, the mouse does not transfer over, nor does the mouse toggle to my client (mac laptop) when I hit the hotkey combination I configured. (meanwhile, the client side still says "Synergy is starting" and cycles through multiple connection timeouts. Hi @AverageJoe! Please provide more details about your machines (OS, 32/64 bit, Synergy version installed, connected to the network via Ethernet or Wi-Fi, specify which one is the server). Also, post a screenshot of both machine's Synergy interface and the Server Configuration interface on your server machine. I fiddled around with the settings and somehow both machines see each other and K&M transfer over. What I am trying to figure out at the moment is how to create one hotkey combo to toggle between the computers on the synergy map. It's annoying to create a different hotkey for each computer on the map. Could you please help out with this? Hi @AverageJoe. Is it for switching to the other computer and switching back? Yes sir. I have 2 hotkey combos set up. One to mive to the mac and another to move to the windows PC. I need help creating one hotkey combo that toggles between both computers. Hi @AverageJoe. I was able to create a configuration file that would allow you to only use one hotkey to toggle between two machines. I just want to verify two things before sharing it to you. What hotkey would you want to use to toggle? (I currently have set mine to use Ctrl+`. Would you want to switch screens using only that hotkey? or would you still want to switch screens with moving the mouse cursor the other machines direction? Thank you for your reply @Paul Suarez. I would like the toggle to be Ctrl+LeftShift+z please. Regarding point 2, I prefer to switch screens only when I use the hotkey. I'll save the "you're welcome" part when it completely works on your setup @AverageJoe. Can you post your current configuration here together with the screen resolution information for your monitors? Sure thing @Paul Suarez. Could you elaborate on the "current configuration" request? What exactly would you like to know? I use a Windows PC and macbook air on 1 monitor. The monitor's default resolution is 1920 x 1080. I sent you a private message @AverageJoe. I replied just now @AverageJoe. Let me know how it goes. It works perfectly but it lags a little from time to time. I always wondered, does Synergy work over my local network or does it need an internet connection to function? I'm not sure if the lags are due to heavy internet traffic or local network traffic. Either way, thank you very much! For Synergy v1.x.x, it doesn't need Internet connection. Are you using Wi-Fi network for both machines? Ok, thank you. Yes, WiFi on both machines. What Synergy version do you have on each of your machines? Do you have an Ethernet port for each of them? Do you have 64 bit system on both of them? On my windows machine (server) & macbook (client), I have 1.8.8-stable-25a8cb2.I have an ethernet port on my Windows machine but no ethernet port on my macbook air. However, one can be used via a thunderbolt to ethernet adapter. Both machines are running 64bit OSs. I noticed a bug in the config file you sent me. On the windows machine (server), if I move the mouse to either edge of the monitor (left or right edges), the mouse pops up out of the other edge as if the left and right edges are stitched together. Hi @AverageJoe. I guess that's because the config file I made is to have a wrapped around configuration. Virtually, your screens are looped. Like if we haven't set it to only switch with the Ctrl+Shift+z hotkey, moving your mouse to the left edge of the machine on the left will result to mouse getting to the right edge of the machine at the right. This happens on your current configuration when it's the first time you booted your machine or even with just the Synergy. Best practice with that config file I made for you is to perform the switch twice before actually using it. So it's like perform Ctrl+Shift+z first (it switches from server to client) then do it again (switches back to server from client). This ensures that scroll lock is triggered on both machines before actually using it. Or if still acts out while in the Windows machine, press scroll lock on your keyboard (do it on your on_screen keyboard if your physical keyboard doesn't have one) while your mouse cursor is in your Windows machine's screen. Great! I appreciate your help! I'm having the same problem with version 2. Would it be possible to create a config file with the same functionality as the previous one? (transfer K&M with Shift + Ctrl + z)? @AverageJoe Have you tried Synergy 1?